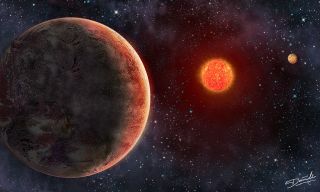 Artist’s illustration of the GJ 273 system, which consists of a red dwarf star and two known planets, one of which may be capable of supporting life. If there are any intelligent aliens in the GJ 273 system, they can expect to hear from us about a dozen years from now. Last month, scientists and artists beamed a message to GJ 273, a red dwarf also known as Luyten's star that lies 12.36 light-years from Earth, project team members revealed today (Nov. 16). Luyten's star hosts two known planets, one of which, GJ 273b, may be capable of supporting life as we know it. "It is a prototype for what I think we would most likely need to do 100 times, or 1,000 times, or 1 million times," Vakoch told Space.com. "To me, the big success of the project will come if, 25 years from now, there's someone who remembers to look [for a response]. If we could accomplish that, that would be a radical shift of perspective." METI is controversial for another reason as well. Some critics — most famously, physicist Stephen Hawking — have suggested that the strategy could betray our existence to super-advanced hostile or resource-hungry aliens, with potentially dire consequences for humanity and the rest of the planet. But beaming a message to Luyten's star doesn't increase the risk of an alien attack, Vakoch said. "It's really hard to imagine a scenario in which a civilization around Luyten's star could have the capacity to come to Earth and threaten us, and yet they're not able to pick up our leakage radiation," he said, referring to the TV and radio signals that have been slipping out into the cosmos from Earth for more than half a century. The Luyten's star project, known as "Sónar Calling GJ 273b," is a collaboration involving METI International; the Institute of Space Studies of Catalonia in Spain; and Sónar, a music, creativity and technology festival in Barcelona, Spain. "Doing it in partnership with the Sónar festival is a way that we can respect the necessity of incorporating a scientific perspective but also to recognize that doesn't capture the fullness of the human spirit," Vakoch said. Team members crafted a message that includes a scientific and mathematical "tutorial," as well as 33 short musical compositions by artists in the Sónar community. The team beamed this message out in binary code at two different radio frequencies on Oct. 16, Oct. 17 and Oct. 18, using the 105-foot-wide (32 meters) European Incoherent Scatter Scientific Association (EISCAT) radio antenna in Tromsø, Norway. Luyten's star was chosen primarily for its proximity to Earth, which could theoretically lead to a relatively rapid response. The red dwarf is the nearest star visible from the Northern Hemisphere that's known to host a potentially habitable planet, Vakoch said. (That planet, by the way is a "super-Earth" about three times more massive than our own." The October transmissions represented the first phase of "Sónar Calling GJ 273b." The group also plans to send an "expanded tutorial" to Luyten's star in April 2018 at several different radio frequencies, turning the EISCAT antenna into something like a musical instrument, team members said.